What makes us unique from others may seem weird to us but God may want to work through those quirks. Laurie Wallin, a Life Coach, writer and speaker, focuses on helping people discover what make them different from other people and embrace their “weirdness” in her book Why Your Weirdness is Wonderful. She talks about how strengths have a dark side as well and people have to be aware of them to better serve God with the strengths He has given them. This book is a short read with short chapters. There are questions at the end of each chapter to get the reader thinking and discovering their strengths but also how they can use them. I liked that Wallin used examples from her life as well as from the lives of people she knows as it gives something for the reader to hold onto and helps explain what Wallin is trying to say. I found the book is a little forgettable as it’s not that different from other strength finder/spiritual gifts books out there. I finished the book yesterday and I found that I remember the overall message Wallin was trying to get across but I forgot many of the finer details as well as some of the things she was wanting me to put into practice. However, I did enjoy that she used the words “weirdness” and “quirkiness” because it seemed like something I could relate to more. It also acknowledged that some of my strengths might be what I would consider weird in myself. Overall, I enjoyed the book and would recommend the book for those who see their weirdness as weaknesses. With the wording Wallin uses, it could really appeal to people who think of themselves as weird and struggle seeing their strengths. In honor of Valentine’s Day approaching, I have decided to write a blog post to singles. As a single, you may have felt like me at times and left out. Feeling like you don’t know where you belong with everything that the world throws us about relationships. It happens all the time in churches. A book I read recently, titled Table for One: The Savvy Girl’s Guide to Singleness by Camerin Courtney said this about singles being misfits in churches. …I’m afraid our churches, in an effort to counteract the decay of the family unit in society, have almost overcompensated so that family equals church and church equals family. This sounds fine until you try to factor in singles. Where do we fit in on Sunday morning? Sadly, sometimes we’re left to conclude that we don’t. I’ve experienced this lately in my own church. In the past month or so, I’ve noticed how much time and effort they put on marriages and family. A little over a month, my pastor did a sermon on marriages. I found it very easy to tune him out because it didn’t apply to me at all. I’ve also seen in our prayer & praise section in our bulletin prayers for marriages and families. One day I decided why should we just pray for those who are married. Why not pray for singles? We need prayer just as much as others. I emailed our church’s secretary who puts together the bulletin to pray in a prayer request for singles. The following Sunday, I watched closely to see how my church would respond to the request. I was pleased that they had included the prayer request in the bulletin. However, I was disappointed when it came time for the person who was leading the service to pray through the requests. He added couples and families into the prayer and he started with them. He turned the meaning of the prayer into something different than I had intended and I was quite disappointed. I could write a lot more about this topic but that is besides the point. For those of you who are single I encourage you to celebrate your singleness this Valentine’s Day. Don’t let it be about wishing you had someone to share the day with. Do something special for yourself this Valentine’s Day. Do something you enjoy doing. Spend time with friends. You want to pig out on candy and chocolate, do it! Who’s stopping you? (In my opinion, cinnamon hearts are the best part about Valentine’s Day anyways and I don’t need a man to enjoy those :)). You could even write a list of things that are great about singleness. Here is a list of my favorites from the book I mentioned before. Some of these are specifically for females but some can also apply to males. We can make spur-of-the-moment plans. And when we do, we don’t have to call home and check with anyone to make sure it’s okay. We can squeeze our toothpaste tube any ol’ way we want to. We can read in bed as late as we want to without the light bothering anyone. We can hog the covers, the closet space, the ice cream, and the remote. In winter, we can go weeks without shaving our legs and no one knows. We’re still allowed to notice cute boys. We can wear sweats to bed and no one’s disappointed. We can play with, cuddle, and spoil other people’s children, then give them back when they get whiny or poopy. There are no in-laws to attempt to get along with. We can go where we want on vacation. All the hairs in the tub drain are ours. The joy of Me Nights. There are a few less balls to juggle (a husband and kids) in this fast-paced, multipressured world. There are more great things about singleness in the book so I encourage any single girl to read it. What would you add to this list? If you’re married or in a relationship, you can add things too. Taylor Martin is a teacher of criminal psychology at a small university and helps law enforcement profile cases. She starts receiving threatening notes along with other things, indicating that someone wants to kill her. 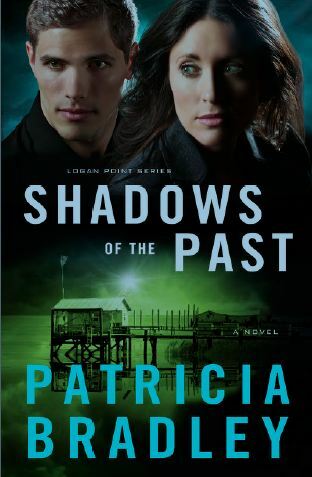 She returns home to Logan Point to search for her father who disappeared twenty years ago. Her stalker follows her home and the shadows of the past come to haunt her. Nick Sinclair is a mystery writer whose wife died two and a half years ago after a mugging gone wrong. His path crosses with Taylor’s and he tries to clear the name of his younger brother who Taylor suspects is her stalker. Sparks fly between them and they both have to put their pasts behind them to let themselves love again. They have to work together to find Taylor’s stalker. Patricia Bradley hooked me in from the beginning. The book starts with introducing us to Taylor’s stalker while she is at a crime scene and gets the reader questioning who it could be even though Taylor feels like she knows who it is. As the story went on, I suspected more and more people of being her stalker and questioned little things that were in the story that I felt were going to come back in play. I was left questioning for most of the book and it took me longer than usual to figure out who was the stalker. The writing style also drew me into the book and made me feel along with the characters. I felt the suspense and fear in the characters and I also felt the romantic tension between Nick and Taylor. I felt like the faith theme was almost thrown into the story as an afterthought. It’s not strong in the book which will resonate with some readers. However, there are some scenes with faith that seemed thrown in as if the writer thought, “Oh, yeah, there should be something with faith in the book.” I don’t know if Bradley actually thought this way but that’s the way it felt to me. I think readers of romantic suspense will enjoy this book for the suspense of Taylor’s stalker but also the sparks that fly between Nick and Taylor. Readers will also wonder what actually happened to Taylor’s father when he disappeared. Fears run my life. As someone who has an anxiety disorder, I have a lot of fears and I tend to let them win. They take the fun out of my life and cause me to miss things that I would otherwise enjoy. I have other fears but those I don’t know how to put into words or I don’t know what exactly it is I fear. As you can see from that list, I fear things that are not concrete. They are also very hard to avoid. When people are afraid of heights, they avoid heights. A lot of my fears are emotional or mental and I can’t really avoid my brain. There are times when I try to avoid my fears by trying to avoid people or any situation that may cause me to be anxious but that doesn’t always work and then my fear of ending up alone kicks in. So no matter where I go, my fears will follow. A couple of weeks ago, I posted a blog post about LungLeavin’ Day which is a day that a couple created to smash their fears. Today I visited their website to smash my own fears and I recommend you to do the same. Don’t be like me and let your fears run your life. Get rid of your fears.